What could be better than a neighborhood bar that always has your favorite beer on tap and never closes? Philly has a ton of great nightlife options, but for someone who loves to entertain, you can’t beat designing your very own watering hole. 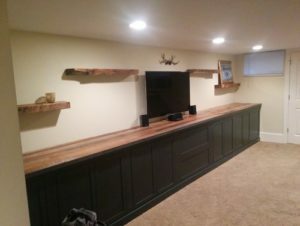 Take a look at a recent project we completed and see how a remodel including basement bar cabinets, mirrors, and shelving gave our clients a fantastic new place to entertain guests. 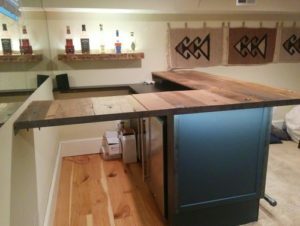 We used a corner of the basement to install a gorgeous L-shaped wood countertop on top of large black cabinets. Then, to give the space a more traditional bar feel, two must-have features were installed. The first is the mirror on the back wall, a mainstay in bar and restaurant décor. This large mirror was cut to fit along the window and the ductwork. Next, the second feature that gives this area an authentic bar feel is the footrail installed at the front of the bar. As you can see in the photo above, the back of the bar is accessible through a lift-up opening. These are ideal for small spaces, as they can maximize your surface area without compromising functionality. Beneath the wood countertops is an inset mini-fridge so you can serve up chilled drinks easily. Then, on the opposite wall, we’ve installed a shelf to showcase go-to mixers. Finally, for flooring that’s easy to keep clean, hardwood has been installed. To bring the entire room together, we installed wall-to-wall matching black cabinets and wood countertops. This area provides a ton of storage space as well as an entertainment center for their TV. Now, they’ve got the perfect place to share drinks with friends while watching the Eagles, Phillies or Flyers. 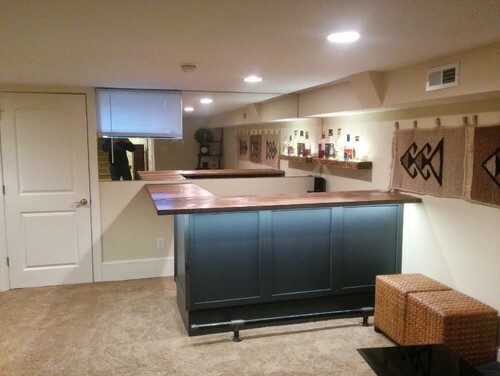 Basement remodels are a fun way to put your personal touch on your home. Plus, finishing your basement is a great way to add value to your home, as it typically nets a 75% return on your investment. Ready to Design Your Personal Pub? To check out additional photos of this basement bar cabinet project as well as many other projects, you can check us out on Houzz or take a look at our portfolio. To start designing your own personal pub, schedule your complimentary consultation today!